The Coupon Mom’s Guide Giveaway and Review! Most of you know who Stephanie Nelson is. If you have been in the coupon business for long you have probably heard of her (The Coupon Mom), her website (Coupon Mom), or her charity (Cut Out Hunger). The Coupon Mom has appeared on Oprah, The Today Show, and Extra to show people her strategic shopping strategy. Lucky for us she released a new book this month! I think my favorite part about her book is that she shows people how they can save money no matter what their personality type and savings strategy is. It reminded me of my Coupons 101 post where I break down three different time investments and how much you can save using each one. Not everybody wants to spend mountains of time, but the option is there. Most people are willing to spend a little bit of time if they see the rewards. According to Coupon Mom there are Busy shoppers who could save 20-25% on their shopping trip with just 5 minutes of planning. There are Rookie shoppers who can save 40-50% on their shopping trip by learning how to combine programs. There are also Varsity shoppers who can save 60-70% on their bill by “cherry-picking” the best bargains. Coupon Mom even included a chapter on Organic shopping! That is getting more and more popular and many people do not even realize you can save on organics. She also goes into the drugstores and how shopping at them before you actually need the products can save you tons of money. One of my favorite things about Coupon Mom is her charity, Cut Out Hunger. On her website and in her book she talks about giving back your stockpile and grocery finds to local food pantries, women’s shelters, and humane societies. You will find that often times the wishlist for these groups includes pasta, pasta sauce, boxed meals, canned goods, etc. Soon you will grow to realize that these are the items that you can find most often for free! Coupon Mom realized that too. She started Cut Out Hunger at her church when she taught a group of women how to strategically shop so they could also fill the local food pantry. The Coupon Mom’s book is a great read. It is perfect for the beginner shopper and it will even teach a few things to those who think they know it all. At only $15 it is a smart investment in your future. Actually it is only $9 at Amazon right now! 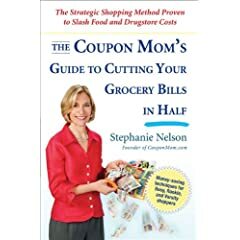 Of course you can always win a copy of The Coupon Mom’s Guide to Cutting Your Grocery Bills in Half: The Strategic Shopping Method Proven to Slash Food and Drugstore Costs here! It is simple, just do any or all of the following items. Leave a different comment for each item that you do. Let us know about a time you used your coupon or drugstore savvy to give back to your community. Promote this giveaway via a blog post, facebook, twitter, forum, or stumble. This giveaway will end on Feb 11th. The winner will be announced here and that person will have 48 hours to contact me with their information in order to claim their prize. I would love to win this book because I am always looking for additional tips on how to cut my grocery bill. I am down to cutting it by 60% on average each week but would LOVE to try to cut it even further! The way I use my coupon/deal shopping savy to give back is that I stock up on lots of free items to donate to local food drives and I also still buy formula when it is super cheap or free to donate as well. I would love to win this book – I really need some help couponing. I seem to spend more trying to use coupons and purchase a lot of things I don't need, want or will even use just because I had a coupon. I would love this book because I'm very new to couponing and need help figuring out how to do transactions and save money. We really need to find a way to save more money right now. I would love to win this book to help me break that 50% savings barrier. I'm on a mission of self improvement this year, from quitting smoking to eating breakfast to (finally) opening a savings account and using coupons to maximize my savings. I would love to win this book because I think it would be very helpful and informative and help me to reach my goals. I give back to my community by collecting the free items from the drugstores and donanting them to the food pantry, or like with the glucose meters I donated those to the local clinic. I would like to have this book b/c it seems I don't hardly save w/ coupons and it's such a hassle! Maybe I need more tips lol. I would love this as there is always more room to learn about coupons! I donate frequently to my church and food bank. I have a little stockpile for this reason. Added to my "Giveaways Galore" page! I've previously entered the Skin MD giveaway! I'd love to win because there's always more I can learn. I would love to win this book beacause I could really use help in saving my family money. I really would love to get past the 50% mark! While I do use coupons and save some, I have 18-year-old twins that I certainly could use help with when buying groceries! I have not even yet made the 50% mark so would love the extra help that Stephanie's book can provide. Btw, nice new look. I love your old look, too, but it's always nice to change things up a bit. I always like to learn new tricks to saving money!So this book would be great! I have a coupon collection set up at my church. People give me their circulars and I then shop and donate to charity. I have donated over 1,500 pounds of food and personal care items to my local food shelf doing this! I am trying hard to cut my weekly grocery expenses but I never seem to be able to get below 40% saved. I certainly could use some help with this book. I would love to win this book to give as a gift to my sister-in-law. She was so inspired by the Coupon Mom when she saw her on TV one day and I think she'd really like to have the book! I have my husband do the shopping ….I am terrible with it! I have four boys and really have to stretch the grocery dollar! I'd love to do it smarter. Thanks for the giveaway. I’d love to read this book since I’ve recently become a stay at home mom not of my own choosing (unemployed), so I’ve just started becoming more coupon savvy. Free Giveaways, Freebies, and Online Deal Roundup!